Torjus, what exactly do you mean dried in large pieces? The way its in the pic, on the bone and let hang? I’m sure the meat would spoil that way when the summer comes.i must be misunderstanding what you are saying. The meat was dried either like in the picture with the bones in or they were removed. 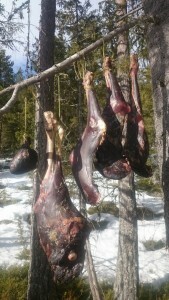 Either way, when it is dried through it should be like other dry meat and will store even during the summer. The fats might go rancid, but this is generally very lean meat, making it less of a factor. Im really surprized to hear such thick pieces actually dry. Especially the hind quaters. Ive let meat hang (deer) in quaters in the fall. I really dont remember the temperature, but it was above freezing mostly, but fairly cool weather. After 2 weeks the exterior got a dry crust, and the meat aquired a bit of a strong smell. Still edible. It definitely lost moisture but was still nothing that could be called dry, and i assume it would spoil soon in warm weather. Im curious to learn what i could do different? Maybe conditions were too warm and humid? It was hanging in outdoor shed that was well ventilated. Pursuing an unconventional lifestyle that involves harvesting resources from the bush yourself can be challenging. I think its great that people like yourself find ways to do it even on that crazy continent of Europe. I think drying such big pieces is very climate dependent. In the north is was common, preferably as a freeze drying. I started a bit late this time, but there is plenty of snow around so I think they will be fine. You might want to try salt curing them if you don’t have the appropriate climatic conditions. In Scandinavia it is very possible with the right alliances. I was lucky to be born in a good area, which helps. About 80% of all the food consumed by me and my friend Jon is currently from the wild or grown (vegetables). The remaining 20% is consumed mainly as a variety issue, rather than for calories. Without access to a lot of hunting liscences and free fishing, it would be very difficult though. Virtually impossible. Nothing like dried meat. I can eat it every day. I usually jerky all the lean meat from a deer. My favourite way to eat deer meat. Although a steak or roast is good for a change.